The Rangers are headed to Florida for two games against the Panthers and Lightning. This comes after a week long hiatus following an atrocious stretch of hockey for the Blueshirts. At this point, I think the “they can sneak into the playoffs” crowd has quieted into more realistic expectations. Let’s go through my brain, however risky that may be. 1. Yes, the playoffs crowd has certainly quieted. It was never a realistic scenario in the first place. 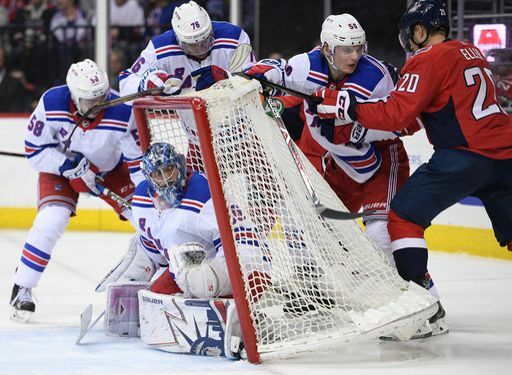 The Rangers do not score at all (80 goals in 28 games is no bueno, and that includes the “winning shootout goal”). There’s only so much you can do with 2.85 goals per game. That said, it is usually enough for Henrik Lundqvist. 2. The problem is that aside from the 9-1-1 stretch, the Rangers have had trouble with protecting against quality chances. It’s weird to say, because they were doing so well to start the season. Then lately it’s like the high danger area is made of lava. Considering how David Quinn’s defensive zone system is predicated on simpler defensive play and limiting Royal Road passes and chances from the slot, the recent play is frustrating. 3. I don’t think a potential playoff campaign would have changed how the Rangers were going to look at their season. Kevin Hayes and Mats Zuccarello are likely trade bait. The Rangers will probably look to unload Brendan Smith and/or Marc Staal as well. Perhaps even Kevin Shattenkirk will be headed out of town. February will be an interesting month for the Blueshirts. 4. Now if the Rangers played every game at MSG, they might make the playoffs. Considering how badly they played at home last season, I’ll take the home wins as a positive. It doesn’t help their draft position, but watching them win at MSG is a step in the right direction. 5. Speaking of their draft position, the Rangers currently sit around the 11th pick. By my count, there are three teams (Carolina, Philly, NJD) that should jump over them in the standings, moving them to 8th. There’s an outside chance the Panthers and Coyotes jump over them too, moving them to 6th. That’s way too far down the road to predict, but something to keep an eye on. 6. I wonder if Lindy Ruff is still running the defense? 7. Henrik Lundqvist. Still elite. Way too early for this but perhaps newhook is a realistic target? Let’s say we have our own 10th pick in the first round. If we move Hayes. Zuuc and maybe one more player, what can we hope for? How about another first round pick and 2 to 3 second round picks. This would give us 4 or 5 in the top 60. Also some Cap savings. Probably not drafting someone who makes the big club, but can we say that Kravsov is in the NHL next year? That said, we still need a stud winger and defenseman. Would Gorton go buy Panarin? Maybe, but is there a solid defenseman out there who we also can acquire? Next year will be another lean year as there are only defenseman on the brink of making the big club next year other than the Russian kid, I think we are looking at this year and next for no playoffs. I gave you thumbs up, but I’m not sure about Panarin… too old! That 9-1-1 stretch scared me, because I thought that it would delude the Rangers’ FO. But then reality set in again and disaster averted. Never fails to amaze me how we see so many more “thumbs up” & “thumbs down” more than actual commenters. If you agree, say it, if you don’t, offer a valid argument against. anything remotely against a “fan fave” gets voted down by rule. Anybody see an update on the Kravtsov injury he left the game yesterday? Replying to my own question LOL, Blueline station is reporting he is ok. But more concerning to me they are also reporting his agent says he will jump to North America this spring when the KHL season ends in FEB. I do not want him to play pro hockey here for us this spring if it means having to expose him to the expansion draft. If we wait to bring him over until next fall I think he would not be eligible for Seattle to take. I say let him play u20 for Russia in the fall and bring him over in the summer. Right from the beginning I said we wouldn’t make the PO’s, but I was enjoying watching the kids. Nothing has changed fro me, and I hope the organization continues down the rebuild course, it’s in our best interest in the long term. In two, or three years, the defense will be Rykov, Miller, Lindgren, Hajek, Pionk, ADA, that’s not hay folks. We will draft some wings, and then sign a veteran for leadership, bingo, we have a winning formula that will be in the running for the cup for years to come!!!!!!! Shatty could have a role under the right circumstances. This is true. Like the circumstance where a miracle happens and we have 6 outstanding defensemen! nah, get a true top pair D man and Shatty is fine. As I’ve stated on many occasions, I’m not a big Shatty fan, and was opposed to his signing. I’d be very happy if he were traded, and ADA, or Pionk played in his place!!!!!!!!! Zuc and Hayes is time up move them get what you can. Its going to be slow maybe two years to develop talent like i saw in that Winnipeg team, dam there good. Winnipeg didn’t become a talented team by trading away all their players, nor should the Rangers. Building through the draft and developing talent is what makes a sports franchise successful. While some players have to be moved from time to time for cost control, throwing out the baby with the bath water is not a recipe for success. I believe they will retain a few of the veteran players, such as Zibanejad, Skjei and maybe Shatty because he is relatively cheap. They might retain Buchnevich and Hayes. Of course the King and Georgiev for now too. But, Hayes could go in a trade if they cannot agree on a contract, and possibly any of the others I listed except Hank could go for the right offer. But I don’t believe that they feel the need to trade a young player like Zibanejad or Skjei. They will see what they have in Pionk, DeAngelo, Chytil, Howden and Andersson and fill in more players as time goes on. The process is definitely going to take 2 or 3 years more. You’re right, and Winnipeg was already in the process of putting together a pretty good team when they also drafted Laine at #2. success at the draft makes all the difference though. the 2015 roster already had e.g. Scheifele, Trouba, and Nik Ehlers, taken with #7 and #9 picks, though they had remained committed to some key vets like Wheeler and Byfuglien through the entire early 2010s period while those picks were still coming to fruition. So, who are our key vets that are worth committing to – it’s not clear that we have a Wheeler or a Byfuglien – and what will our recent #7 and #9 turn into? Why all the thumbs down for David’s article? He was right on every point. This is a bad team, as it is now. The “purge” needs to continue in Feb. Hayes, Zuc, McQuaid, and maybe even Names, all gone by the trade deadline. Clear cap space and then bring the kids up and let them all play. Looks like Kravtsov coming to North America after his KHL season, as his team is awful and will not make the playoffs. In spite of the bad team, Krav killing it.